This past school year my wife took a full-year Organic Chemistry class. For her textbook she used Organic Chemistry (11th edition) by T.W. Graham Solomons, Craig B. Fryhle, and Scott A. Snyder (Wiley, 2014). With gratitude to Wiley for the review copy, what follows is her assessment of the textbook. Organic Chemistry is divided into 25 chapters, covering the standard terrain like “Aldehydes and Ketones” (chapter 16), “Alcohols and Ethers” (chapter 11), and “Carboxylic Acids and Their Derivatives” (chapter 17). It hits the core basics in the beginning and then goes through all the essential mechanisms. There’s even a chapter on NMR (chapter 9: “Nuclear Magnetic Resonance and Mass Spectometry”), in which the reader learns, among other things, about the chemistry behind an MRI. A central theme of the authors’ approach to organic chemistry is to emphasize the relationship between structure and reactivity. 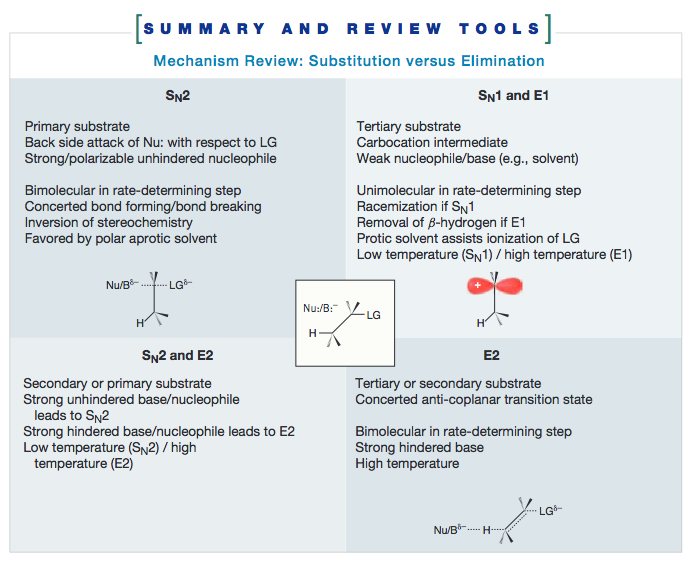 To accomplish this, the text is organized in a way that combines the most useful features of a functional group approach with one largely based on reaction mechanisms. Emphasizing mechanisms and their common aspects as often as possible, this book shows students what organic chemistry is, how it works, and what it does in living systems and the physical world around us. Each chapter has explanations of concepts with Practice Problems and Solved Problems scattered throughout the reading. (Solved Problems essentially model what you are supposed to be doing in the Practice Problems.) At the end of each chapter, there is a summary of the chapter and more Problems, the answers to which are in the accompanying solutions manual and study guide, sold separately. (The textbook includes just an eight-page “Answers to Selected Problems” appendix.) The full solutions manual is essential for making your way through this textbook. step-by-step details about how reactions take place so that students have the tools to understand rather than memorize organic reactions. These boxes helped me really understand the mechanisms and do a lot better at solving the problems. The Table of Contents includes a listing of all the places they appear. [T]here is a natural molecule that combines radical chemistry and molecular shape in a way that can cause cell death. Chemists have used this knowledge to fashion a few anticancer drugs. Personally, I was so focused on the class itself that I found myself skipping over a lot of these. They’re well-done, though, and others may appreciate their inclusion. Students can, after all, have a hard time connecting organic chemistry to the “real world,” and it’s easy to get stuck in the details (“Its melting point changed!”) with little awareness of the concepts’ larger import. So I see why they took this approach; I think it’s a smart one. The graphics and drawings of molecules are conceptually clear and a good aid to learning. The chapter on infrared spectroscopy is a good one–this is potentially itself a whole additional course. The writing is straightforward and clear. As I read the book, I could tell it is a revision of a revision of a revision…. Organic Chemistry prepared me very well for taking the American Chemical Society standard exam. It helped reinforce the lectures in the class. The pictures at the beginnings of the chapters feel a little out of place. For example, chapter 10 (“Radical Reactions”) begins with a picture of a bowl of blueberries. Granted, this is present because blueberries are an example of an antioxidant, to be covered in that chapter, but some of these images don’t feel aesthetically consistent with the rest of what’s in the book. The graphics and overall design and layout are consistent and well-executed; it’s just that the photos (including the cover photograph) feel a bit off, compared with the rest of the book’s design. All told, however, this is a minor critique. The binding appears to be glued (not sewn), which is unfortunate for a book of this magnitude. I didn’t carry it around that much (at over 1,000 pages, it’s heavy–to be expected), but it’s still in good shape after a year of use at home. There is an e-book option for those who are willing to be at as screen more often. Organic Chemistry is a very solid teaching of the core concepts and mechanisms of organic chemistry. To professors who are considering a course text, this one is a worthy choice. To students who are considering (or have been assigned) this text, a book like this requires diligence to get through, but it will serve you well! Find Organic Chemistry at Amazon here (affiliate link) and at Wiley’s site here.